Before I began reading The Glass Demon, I was a little concerned. Helen Grant, the author, follows me on Twitter, and I tweet links to my reviews. What if I hated the book? I'm never anything but completely honest in my reviews, and I also promised myself when I began this blog that I'd review every book I read, provided I was reading it for the first time. I feared that if I didn't like the book, there would be Awkwardness. And being English, I'm simply not equipped for Awkwardness (ditto A Fuss, which is like Awkwardness but even worse because it draws actual, you know, attention, and people express emotions and stuff). Fortunately, my worries were completely unnecessary, because The Glass Demon is an absolute gem of a book. The Glass Demon is a creepy, tense young adult mystery, absolutely packed with sharp, perceptive characterisation and clever plot twists, which uses folklore and psychological horror to keep the reader turning the pages with increasing urgency. Narrated by seventeen-year-old Lin Fox, it focuses on her academic father's search for the legendary Allerheiligen glass, a set of stained glass windows long since missing and purported to be haunted by a demon. Opening arrestingly with the discovery of a dead body surrounded by shards of broken glass, the story begins to unfold right from the first sentence. More tragedies occur and more terrible secrets are uncovered, until Lin, who usually prides herself on her pragmatism, becomes convinced that the Glass Demon is something more than a local superstition. Although full of all the best trappings of the Gothic - crumbling ruins, dark forests, brooding priests, pervasive evil, mysterious deaths and a young heroine in mortal peril - The Glass Demon is still a remarkably convincing tale. The subject matter of the story could so easily have made for a novel I just couldn't believe in, but Lin is such a realistic seventeen-year-old, flawed without being irritating and wittily observational without being precocious, that even in moments of high drama the narrative never feels overblown. Lin's dysfunctional family are so believable that they practically leap off the page, and the novel's setting - rural Germany - is equally vivid. The author's choice of setting is just unfamiliar enough for us to understand why Lin feels uneasily out of place, and the rambling forest and mysterious castle are just enough to form a suitably dark, Brothers Grimm-style backdrop for the action. In an opening chapter that, I must say, certainly grabs the reader's attention, the author announces that Lin's older sister will die before the story reaches its conclusion. A brave tactic, this, but ultimately a successful one. Enough is withheld for us not to know how this tragedy might occur, so suspense is maintained, but the knowledge that Polly will die hangs over every page, refusing to leave the reader's subconscious just as Bonschariant, the Glass Demon, refuses to leave Lin's. As if all this were not already enough to add up to a brilliant read, there's also a thoroughly convincing love story subplot and some complex family knots to unpick as we're allowed to dig deeper into the Foxes' past. 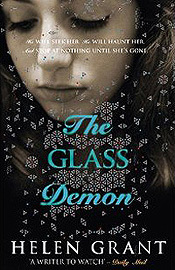 The Glass Demon isn't just great young adult fiction - it's great fiction, full stop. Buy a copy for your daughter by all means, but don't think for one minute that there won't be enough in it for you too. I'd have devoured this book with immense excitement when I was twelve, if only I'd been lucky enough for it to have been around back then - but it's absolutely fair to say that at thirty-five I still loved every word. A very competent and sincere review. I especially agree with the observation that this book should not be restricted to only the YA category just because it has been publicised that way. Totally agree - I often check the YA shelves in book shops and have discovered some absolute gems, including the Patrick Ness 'The Knife of Letting Go' trilogy, Susan Cooper's The Dark is Rising and, of course, Pullman's 'His Dark Materials'. I sometimes think the YA tag allows writers be more imaginative and creative, like they feel they can take more risks. I absolutely LOVE The Dark Is Rising. LOVE IT. Some other young adult books I've really loved are Diana Wynne Jones' Hexwood and Fire & Hemlock and Alan Garner's Red Shift is a huge favourite of mine as well. I haven't read Patrick Ness yet but I've heard so many good things about him that I'll certainly have to give him a go. The Glass Demon is one of those books I knew was going to be good right from the very first lines. In just two lines Grant effectively sets up a feeling of impending doom, and with the third sets up the first death - and thus the rest of the book. With such a strong opening, standards are high for the rest of the book. But Grant's elegant writing and careful plotting make for a page-turning novel that gets better and better with each chapter.